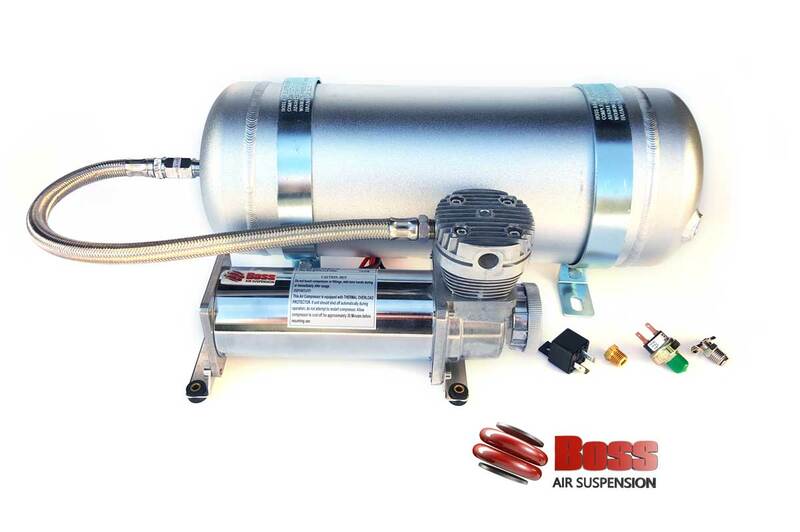 Boss Air Suspension's On Board Air Kits are a great accessory for any vehicle, whether you need to inflate your tyres after going off road or you need to fill your load assist bags to level your vehicle we have a kit that will fit all purposes! In Cab Control unit for vehicles fitted with an onboard air system as well as Load Assist Kits. Airbag Articulation Kit for 4×4 use, bag to bag air bypass kit for off-road use only. situations where bigger volume air is needed but space is tight. Onboard Air control for Load Assist Kits from inside your cab. Simple installation and controls bags independently. Digital Gauge and valve for simple Load Assist Kit inflation. Complete Compressor Air tank Combo. Complete Compressor Air tank Combo. This unit is an all-in-one air source solution with no additional plumbing required.